U.S. 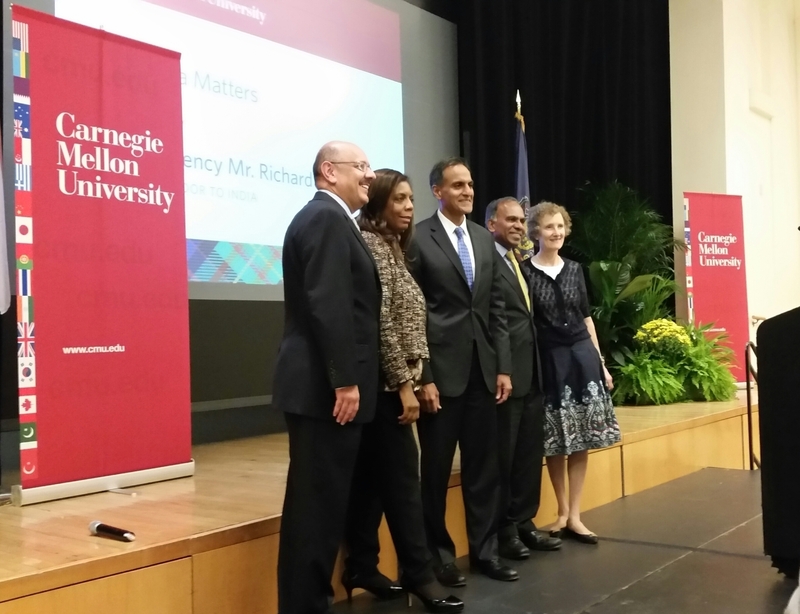 Ambassador to India Richard Rahul Verma visited Carnegie Mellon University’s campus last Wednesday. The ambassador spoke about his personal connection to Pittsburgh and its Indian community, the growing relationship between America and India, and how India will grow and thrive in the future. It was, in essence — “Why India Matters.” The Indian population in America has been steadily increasing in recent years. The same increase in the Indian-American population reflected at Carnegie Mellon. Founded by Andrew Carnegie, a native of Scotland, Carnegie Mellon values the importance of diverse international contributions. Verma traces his roots just up north; the ambassador was born in Edmonton, Canada. His father taught English at the University of Pittsburgh, specializing in Indian Literature. Verma knows the Pittsburgh area well and calls himself a lifelong Steelers fan. When reflecting on his times in western Pennsylvania, Ambassador Verma described his family first arriving here broke in a station wagon, but still feeling welcomed with open arms. “I really do think there is something special about this area, and what immigrants in particular have done in this area,” Verma said. Verma stressed that education is a vital part to the immigrant story. For many immigrants, education is their motivation behind leaving their homelands and undergoing the arduous task of starting over in a new country. Because of this, many immigrant children value education from an early age. Ambassador Verma reflected on his time growing up with his parents and grandmother, who were teachers. He invited the audience to picture just how strongly the importance of education was imposed on him at a young age. “You can imagine growing up in a house with two Indian teachers as your parents,” Verma said. He then recounted a particular memory of him coming home in ninth grade with his report card. It reported five A’s and one A−. For the next three days he was plagued with questions of concern from his parents over the dreaded A−. “ 'What could have happened? Was there a problem with the teacher? Did you not study?’ ” they asked. “No matter where you come from, access to education can be the ladder that helps you climb from one social class to another and is the ultimate key to achieving the American dream,” Verma said, citing values already familiar to many Carnegie Mellon students. Verma also talked about the importance of personal connections — it is not only what you know, but who you know. India and America have formed a close bond that has flourished for many years. Ambassador Verma talked about how the “shared values, the bonds between our [Indian and American] people, our cultures … the shared commitment to learning, innovation, and our democratic ideals” are what made the connection between the two countries a strong one with much potential and a sturdy grounding for sustainability. The strong bilateral relationship between Carnegie Mellon and India has had a noticeable impact on the university community. One such example of this is Carnegie Mellon University’s agreement with the Indian government. The agreement provides $2.4 million in fellowships so students from India can pursue more advanced studies in math, science, and engineering at Carnegie Mellon. Another example is the donation the university recently received from Tata Consultancy Services, which gave $35 million to build a state-of-the-art 40,000 square foot research facility. Relationships like these make a Carnegie Mellon education more accessible. India has seen its share of hardships; currently India has 300 million people without access to electricity, 650 million people that still live in villages, and 500 million people without flushable toilets. However, India has experienced rapid urbanization and shown many other signs of progress. Ambassador Verma discussed the growth that he expects India to have in the coming years; he expects India to have the most young people, the highest number of college graduates, and the most millionaires of any country in the world.